Also, you will easily notice if some of the professionals you have hired is not doing their job properly. It would be wrong to assume that the only task of moving van drivers is to drive the van. The drivers are also expected to check the performance of the vehicle before they arrive at your home. The same professional has the job to communicate with the office of the removals company and to keep them updated on the moving team’s progress and their current location. In some moving firms, the drivers also function as a team leader and they assign tasks to the movers and the helpers and keeps the customers updated. Those of you who have decided to rely on Movers London’s high-quality moving services in Tottenham N15, N17 or those in other parts of the English capital, will also have the chance to hire qualified and competent packers. Their main responsibility is to provide you with an efficient packing and box delivery service in London carry the right type and amount of packing supplies to your house and to pack your possessions. In most of the cases, packers will come to your house on the day before the actual move so that your possessions can be ready in time when the moving trucks show up on the following day. The movers have many different tasks which include taking the client’s items to the moving truck, loading and unloading them. Aside from that, they are also the people who will carry out the viewing of your property and they will assess the size and the complexity of your home relocation. Opt for convenient moving services in Canonbury N1, for example, and the movers can also estimate your moving costs and discuss the specifics of the moving process with the customer. They must arrive at every relocation job equipped with dollies, straps and other moving tools. 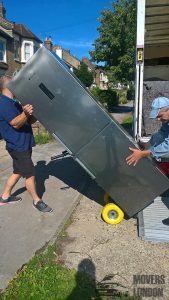 One of their main responsibilities is to ensure that all of the clients’ personal possessions and furniture reach their destination in an excellent condition. Helpers are sometimes also called partial movers and they usually take care of a small portion of the move. Depending on the client’s needs that can be packing, loading, unloading or lifting and moving heavy items. They can be hired as an additional assistance to the main team or as an extra helping hand for people who prefer to plan their move alone. These are the pros that handle the removal of special items such as pianos, works of art, expensive possessions, antiques and etc. They have a lot of experience which is why they are capable of organising executing the most difficult moving jobs from A to Z.